Seventy years ago on this day, Wednesday, April 14, 1943 during the Battle of the Atantic three allied ships (Norwegian Destroyer Eskdale, Norwegian/German Tug Pasvik, and British Naval Trawler Adonis) were sunk. One U-Boat (U-526) was also sunk. There were 122 U-Boats at Sea (Events this day - U-Boat Net). During the previous month March 1943, 107 merchant ships were lost to U-boats (627,000 gross tons). About two-thirds of the tonnage sunk by U-boats during March was in convoy (a record for the war). Since the beginning ot the year, Destroyer Escorts were entering into service at an ever increasing rate. On April 14, 1943 the USS Hurst (DE-250) was launched. 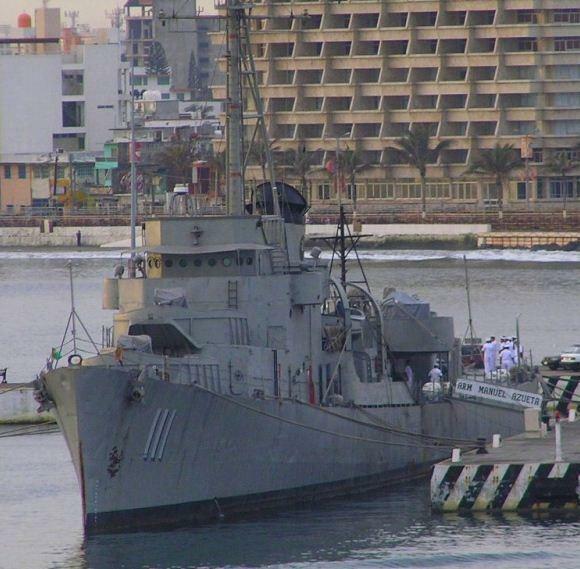 As of 2012, that ship is still in service in the Mexican Navy as the ARM Comodoro Manuel Azueta D-111.